This Instagram feature is GOALS for your account! 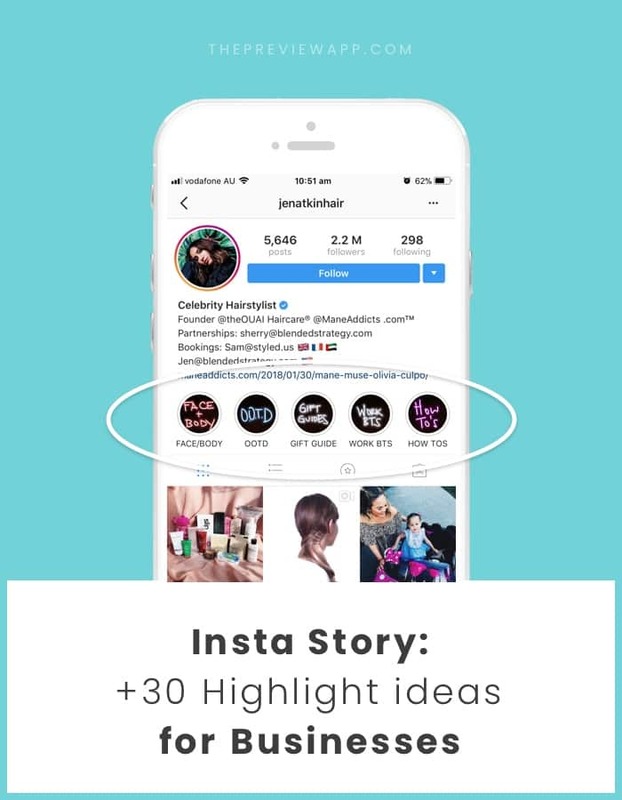 Let me show you 30 Insta Story Highlight ideas for your business. These Highlights (the Insta Stories under your Instagram bio) are another great way to connect with your audience. And they’re a great way to promote your products / services / account. What’s special about you / your products? What can I expect from your account? Think about fun ways to introduce your account. What would you want people to know about you? There are so many different categories you can create. People are always looking for ideas and inspiration. Do you have some top items you would like to share with everyone? Create a new Insta Story Highlight for products that are on sales. Everyone loves a good bargain. Once a month you can share your Top Picks – the Editor’s Pick. What caught your attention this month? What are your favorite items? You can use a Highlight to gather your favorite customer reviews. People love to see what’s fresh and trendy. Create an Insta Story Highlight dedicated to your new arrivals. Do you have a hashtag for your brand? A hashtag for a collection or campaign? Repost the Insta Stories or posts of your customers under one Highlight. People connect with people. Instagram is a social media. Have fun creating memories and content with your customers and share it with the world. More people might be inspired and join your movement. One Highlight can be about one of your customers / clients / influencer. How do they use your product? What do they like about it? A takeover is when one of your customer / client / partner / friend is taking over your Insta Story. They will post on your account’s Insta Story for you. Usually they will tell their followers that they will be taking over your Instagram. This means that more eyes will be on your account on that day. @thebucketlistfamily tookover the Insta Stories of @travelandleisure, a famous travel magazine and Instagram account. Travel + Leisure then transformed the Insta Stories into Highlights. Imagine this: each Highlight is the face of a member of your business or team. It’s like an “About us” page but under your Instagram bio. How cool? Show people your best selling products or services. Each Highlight can be a Collection. A great example is Maisons du Monde @maisonsdumonde. They showcase different collections: “Green Market”, “Golden Oasis”, “Shades”, “Beach Party”. Build anticipation. You have launched products. People love them. What’s next? What do you have planned? Can you give a sneak peek? Do you have some freebies for your people? Let them know and show them in your Highlight. Who doesn’t want to snag extra goodies for free? Do you provides resources to people? Such as eBooks, PDF, tutorials, guides, etc… Put them all under one Insta Story Highlight called “Resources”. This way people know where to look when they need help. Do you share a lot of tips, tricks, guides and tutorials? You can put them all under one Insta Story Highlight. Or you can create multiple Highlights for different kinds of tips. On the topic of guides, you can also share gift guides. Gifts are hard to pick! You can make it simple for people. Give them a selection of your favorite gift ideas from your shop. These are very addictive Insta Stories. We all want to see how the “after” will look like. So if you can show transformations with your audience, try it out! Share quotes that relate to your business. Do you offer different products depending on the season? This is another good Highlight ideas if your business involves travelling. Or it can also involve your customers being in different parts of the world. Another fun Insta Story Highlight idea is to do an unboxing. An unboxing is when you unbox / open the packaging of your product. It’s an experience in itself. Think about it as a big reveal! Can you categorise your Insta Stories based on colors? For example, shops usually organize their clothes by color. Why not do the same for your Insta Stories? I couldn’t find an example for you. But I did find @treeoflife_love who has a Highlight called “Palette“. It features clothes based on colors (blue, blush, etc…). You can create a few “Best of’s”. Best of… your dog? Cat? Recipes? These Insta Stories are great to let people see your process. You can also dedicate one Insta Story Highlight for one product. This is what @monarchtokyo does. One Highlight is about one specific pair of sunglasses. Your product might not be available online (cafe shops, markets). If you have a store, feel free to share what’s new in store. What can people find when they walk through your doors? Your Instagram page could be their first look into your shop. Make a good first impression. Your Instagram is a great way for people to keep in touch with you. It can also drive traffic to your blog. You can dedicate one Highlight for your blog. Every time you have a new blog post, you can add it under your “Blog” Highlight. Giveaways are a great way to grow your account and connect with your audience. To make sure nobody misses the giveaway, create a Highlight for it. Do you attend events? Can you use these events to promote your business? Instagram is a social media. People are on Instagram to be social. So only use this idea if it makes sense for your business. This is another great idea. If you receive many DMs (direct messages) of people asking you the same thing, why not create a Q&A Highlight? Answer the most frequently asked questions. When you create an Insta Story Highlight, you can give it a name. It can be a word (like “Blog”) or an emoji. Your choice! That’s it! I hope this list gave you some ideas. Let me know in the comments if you have any questions, or if you have other ideas.